Kindness is an important, often underestimated, virtue to hold and something we are perhaps all guilty of taking for granted, ignoring even, in a fast moving society. Yet kindness has the potential to impact and individual, and in turn, society. Loneliness and isolation is a growing epidemic and continues to be one of the biggest challenges to the health of our communities. Age Scotland found that at least 100,000 older people feel lonely most or all of the time, and twice as many go half a week or more with no visitors or phone conversations. A report from the Scottish Government suggested that some older people visit their doctor every week or ride the bus all day for company. Loneliness is as damaging to health as poverty and poor housing. 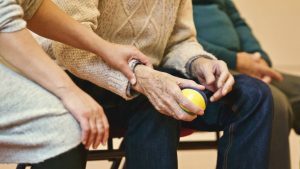 However, it is no longer an issue exclusive to the elderly population, but a concern for all with significant consequences for both individuals’ mental and physical wellbeing, and social cohesion. The first six months of 2017 have seen a number of life-changing events take place across the UK. Both the London and Manchester attacks instilled a sense of togetherness – people of Britain, of all races and cultures, have come together as one to stand against terrorism. These events have brought social cohesion to the forefront and shown examples of where kindness can come and be facilitated easily. It’s not hard to fathom the power of kindness in combating loneliness and isolation, and in turn creating stronger communities. Yet, talking about kindness in a public policy context doesn’t sit comfortably – it’s often perceived as ‘soft’ and too personal. The ‘Place of Kindness’ report from Carnegie UK Trust demonstrates that not only are some communities across the country already using kindness to battle loneliness successfully, but there is an opportunity for everyone to take responsibility, take action and do better. The Carnegie study, in partnership with local organisations across Scotland, demonstrated that simple things make a huge difference. Whether it’s wearing a ‘Friendly Dumfries‘ badge, a daily chat at the checkout or smiling to others in your community who potentially could not have spoken to another person in days, it’s the little things that matter. Having somewhere welcoming to meet, gather or just bump into each other makes a big difference. 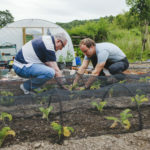 In Moredun, the warmth created by preparing and sharing food together at the Community Cook Club run by Cyrenians is tangible. For some, this is a rare occasion or the only time they have been out of their own home for months. It is hard to believe amongst the clink of cups and ready banter. We also need to challenge the idea that providing ‘community’ is someone else’s job. We found that people understand the shifts which underpin changes in society but also that they miss a sense of community spirit. The truth is we all can and should take action if we are to change that. Whilst it is tempting, and indeed true, to think that the world would be a better place if we could all be kinder to each other, we recognise that there are very real reasons why that is easier said than done. We believe the key might lie in understanding and acting to remove what gets in the way of kindness. In general we tend to perceive greater risk in engaging with others and asking for or giving help within relationships than we did in previous generations. 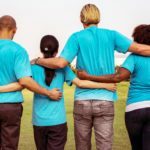 As a result, we increasingly seek more formal routes to be kind – contributing to organised charity rather than in our individual interactions with people. 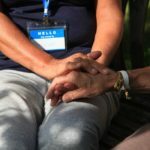 As we formalise relationships in organisations regulation, or perhaps more accurately, the interpretation of regulation is getting in the way of countless opportunities for people to come together and express care for each other. Individuals, charities, local businesses and government have a role to play in creating the conditions for kindness and helping remove the barriers. In doing so we can all help to combat loneliness and create stronger communities. With thanks to Zoe Ferguson for contributing the above guest post. 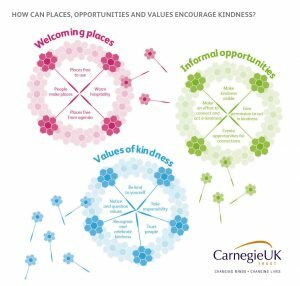 To learn more, you can read Carnegie UK Trust’s report, The Place of Kindness, here and watch the accompanying video here.